^ 1.0 1.1 基督教簡史（四）- 國教時期. Pcchong.com. [2013-11-24]. ^ 6.0 6.1 2011年2月號《人籟論辨月刊》—【帝國之暮，神國之曦】專題—. 台灣大學科學教育發展中心網站. [2013-11-24]. ^ Toulmin, Stephen; Goodfield, June. The Discovery of Time Phoenix. Chicago: University of Chicago Press. 1982: 104–106. ISBN 0-226-80842-4. Cameron, Averil and Stuart Hall, trans. 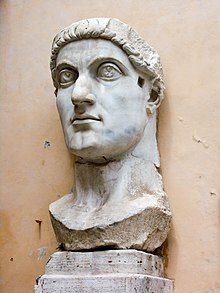 Life of Constantine. 1999. Oxford University Press. ISBN 978-0-19-814924-8. XII Panegyrici Latini（英语：Panegyrici Latini） (Twelve Latin Panegyircs) relevant panegyrics dated 289, 291, 297, 298, 307, 310, 311, 313 and 321. Barnes, Timothy D. The New Empire of Diocletian and Constantine. Cambridge, MA: Harvard University Press, 1982. ISBN * Elliott, T. G. "Constantine's Conversion: Do We Really Need It?" Phoenix 41 (1987): 420–438.